There are few things more precious than the way an older sibling loves on their new baby sister or brother. This week I had two-week-old Mathilda in the studio for her newborn portraits and her big sister, Rafaela accompanied her some of the photos. Rafaela was just three years old and you could tell she was completely head-over-heels in love with her new baby sister. She was one of the most cooperative siblings I’ve had in the studio and I loved the photo I captured of her kissing Mathilda’s forehead. 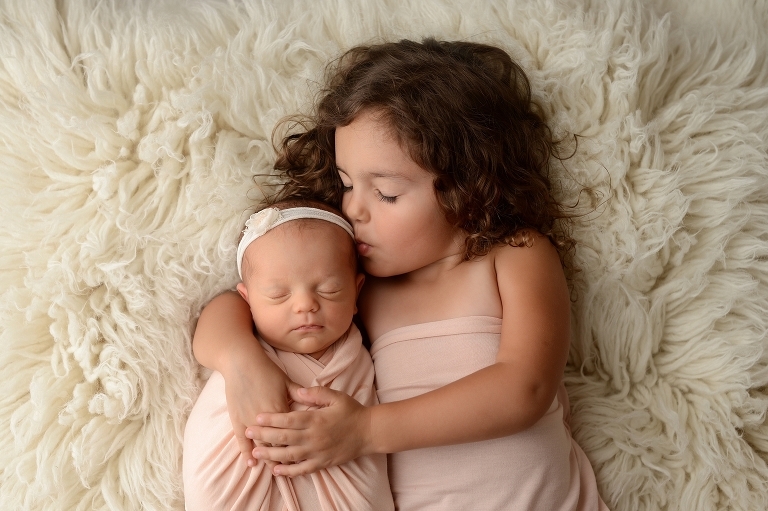 Sibling photos are just too precious for words! When we booked Mathilda’s session the plan was a full newborn portrait session with neutral grays and cremes. The gray complimented Mathilda’s complexion beautifully. Unfortunately, she wasn’t as impressed with us as we were with her. Our plans for a full session were downgraded midway through to a mini session as Mathilda decided she would not be sleeping today, no thank you, ma’am! Despite her ferocious little yawns and one tiny smirk that suggested she truly was tired, she had other ideas for us today. While a wakeful two week old is definitely rare, it does happen from time to time. 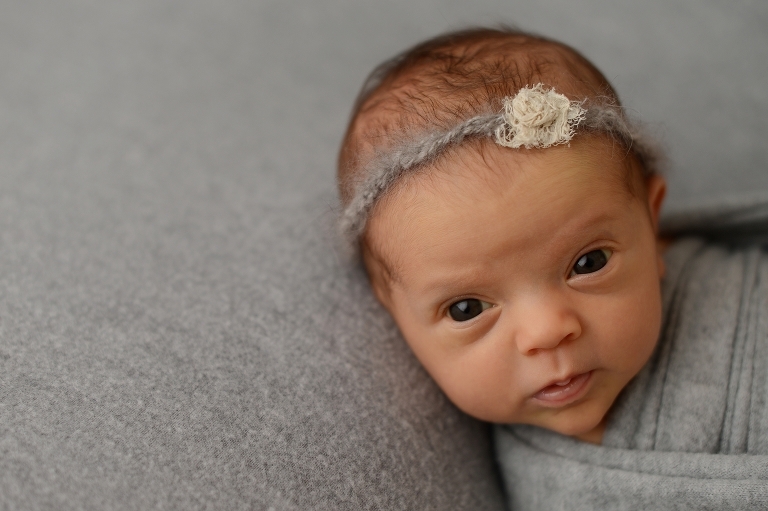 A wakeful baby makes it more challenging to capture many of the traditional newborn poses, but it does make for some truly beautiful portraits. Mathilda’s eyes were so expressive and she gave us so many adorable faces. When we were able to get her to sleep the traditional newborn portraits were perfection. She looked so sweet swaddled in gray and snuggled up next to her sister in shades of pink. Mathilda put up the sweetest challenge but I think we pulled through with some beautiful images for mom and dads walls. 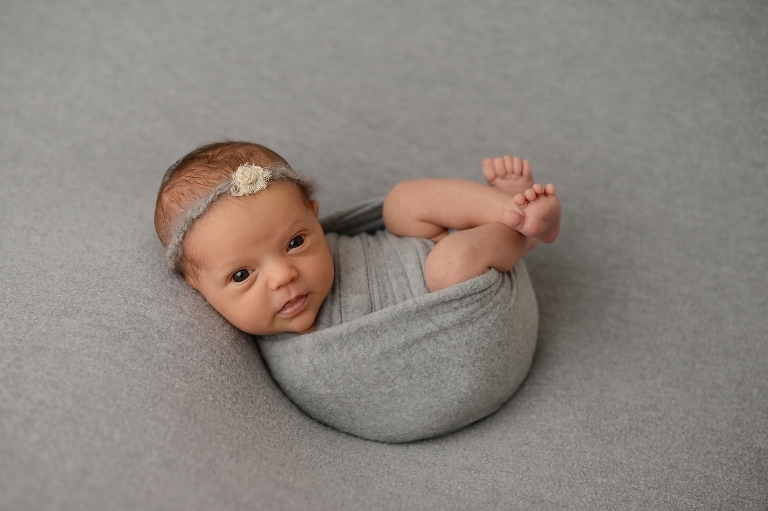 Want to see more adorable newborn portraits? Check out Nicholas’ newborn photos.